High school football is loaded with the sons of NFL great, including Randy Moss, Deion Sanders, Frank Gore, Marvin Harrison, Chad Johnson and Emmitt Smith. The kids are legit and out making a name for themselves. 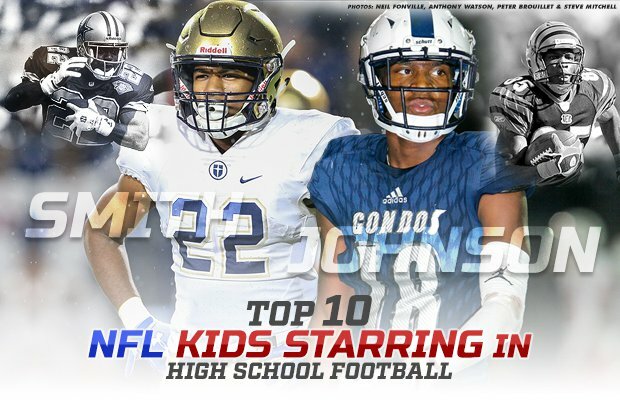 We came up with a Top 10 list featuring the best high school football players who are sons of current or former NFL stars. Watch the video below to see the complete list. Shedeur Sanders, EJ Smith, and Marvin Harrison Jr. lead the list of 10 selected. Of the 10 players selected three have Hall of Fame fathers with 55 Pro Bowls and seven Super Bowl wins combined. Their offspring on the same path — seven of the 10 are at least 4-star talents and the other three are on the cusp. They hail from Texas, California, Georgia, Florida, North Carolina, Pennsylvania and Washington. St. Joseph's Prep (Philadelphia) was the only school to have more than one player on the list as Jeremiah Trotter Jr. and Marvin Harrison Jr. both made it. They are two of the top overall prospects from the Class of 2021. Seven of the 10 are from the Class of 2020 and the other three players that made it will be juniors next year.